All life on our planet began their incredible journeys from a single ancestral cell about three billion years ago. From this common origin, they live; they reproduce; and they evolve. Some of them stick to this single-celled form till now, yet many others chose another path: shifting from unicellularity to multicellularity. It is this crucial shift that led to the emergence of those endless forms of most beautiful and most wonderful, including our own species, Homo sapiens. Yet the impact of the evolution of multicellularity is far more than just about changing the life forms, a whole new level of biological complexity is achieved through this transition: cellular differentiation, cell-cell communication and cooperation, developmental regulation, etc. In contrast to such great importance, our current knowledge about the evolution of multicellular organisms is far from satisfactory, especially in terms of “how”, probably due to the lack of information about the intermediate forms and their habitat from fossil records. The recent study of Ratcliff et al point out an alternative way to solve this long-perplexing evolutionary mystery: studying the evolution of multicellularity by experiment. 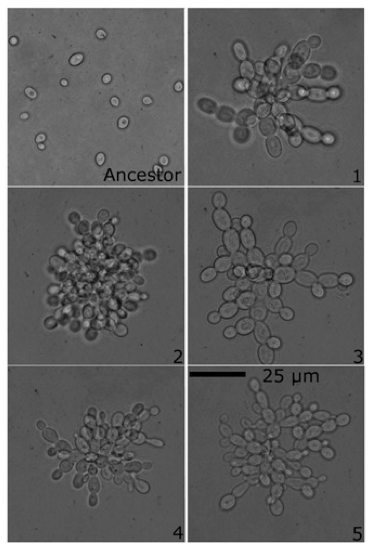 In this study, they used budding yeast, Saccharomyces cerevisiae, as their model system for multi-generation culturing and selected for those individuals that settle faster than others from an isogenic S.cerevisiae population. Ten replicates were used and 60 transfers were carried out during this experiment. The underlying logic behind this design is that clustering individuals have a higher speed of settling in liquid than single cells, therefore such settling selection should favor the clustering phenotypes of S.cerevisiae, in other words, the multicellularity. Consistent with this expectation, they observed that all replicates were dominated by snowflake-like phenotypes consisting multiple aggregated cells. According to the calculation, the fitness of this clustering phenotype is 34% higher than the single-celled form, showing a substantial selection advantage. The first important question with regard to multicellularity evolution is whether the aggregation of single cells occurs preferentially among genetically identical cells or the opposite. Theoretically, the mode of clustering genetically identical cells can avoid the potential conflict among different single cell members thus appears to be more likely to happen during the early stage of multicellularity evolution. A scrutiny of those snowflake-like clusters showed that they are exclusively formed by the adhesion of derived cells from successive cell divisions, thus confirmed the theoretical expectation. Also, such clustering phenotypes are fairly stable, even after the selection pressure was removed after 35 times of transfers, suggesting changes in genotypes are responsible for such phenotypic innovation. Aside from the aggregation of single cells, within-cluster labor division is also a crucial step towards the evolution of multicellularity. In order reach higher fitness peak as a whole, different members within the multicellular cluster are expected to be specialized and undertake different functions. The cooperation among different members often requires the satisfaction of Hamilton’s rule (-C+rB>0, where C is the cost, B is the benefit and r is the relatedness) and the identical genetic background of all those members makes this possible by having the relatedness r=1. A typical collaboration will be that some members sacrifice their chance of reproduction through programmed cell death (apoptosis) to support their relatives (the exactly identical copies of them in this case) getting higher chance of survival and reproduction. In this study, the authors did observe such sacrifice and the corresponding smaller yet more “next-generation” clusters. The programmed cell death of some members led to the decreasing strength of their attachment with daughter cells thus helped the separation of newborn clusters from the parental ones. As far as I am concerned, several remarks can be made for this interesting and important study. First, as mentioned above, I think this study revealed the considerable power of such long-term evolution experiments in exploring the mechanism of multicellularity evolution. Similar study in more organisms (e.g. green algae) with more realistic selection treatment (the choice of settling selection in this study is purely due to experimentally convenience as the authors acknowledged) is needed in future. Second, the evolution of multicellular S.cerevisae within just a couple of weeks suggested the evolution of multicellularity may be not that difficult and slow as what we thought before. This is consistent with our knowledge that multicellularity has independently evolved several times in different evolutionary lineages in history. Third, an interesting follow-up of this study will be using currently widely-available next-generation sequencing technique to identify genetic changes that associate with such unicellular to multicellular shift at the sequence level, which will greatly help to bridge the gap between micro- and macro-evolution with regard to the evolution of multicellularity. WC Ratcliff WC, RF Denison, M Borrello, M Travisano. 2012. Experimental evolution of multicellularity. PNAS. doi: 10.1073/pnas.1115323109.